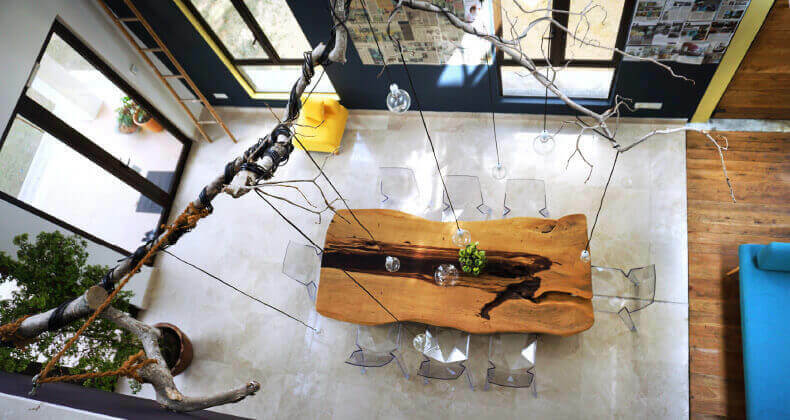 Guests stepping into the foyer of the Santa Fe office will immediately notice the nature inspired concept that brings the outdoors inside, complete with a natural wood table as the centre piece. A tree branch taken from Su’s previous home has been made a lighting feature, blending well with the cosy indoor courtyard and garden next to it. Favouring a ‘flat’ and non-hierarchical approach, the main work area is an undivided set-up surrounded by floor-to-ceiling glass for natural light. One level above, a cosy conference space (left) sits adjacent to the library inspired by Japanese Zen sensibilities (right). 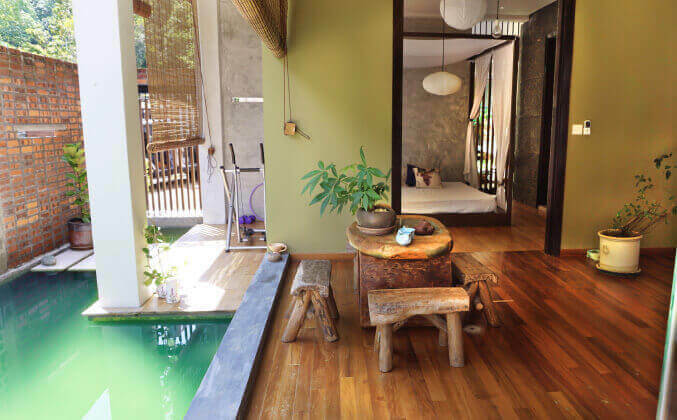 The courtyard adjacent to the family living room is Su’s favourite spot to meditate while watching the fish swim in the pond. Favouring an open plan kitchen and dining area, the shelves displaying raw ingredients on the left make a fetching scene. A children’s nursery and reading corner sits on the third level of the home, where visiting family and friends often gather. 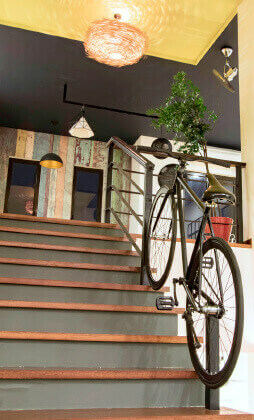 Quirky design features, such as this bicycle welded onto the stair railing, add a fun accent. Achieving a work-life balance is something most people aim for. Yet blurring the lines between the two is what Fendarie Su has strived to do in Santa Fe, the dual-house named after her interior architecture firm. 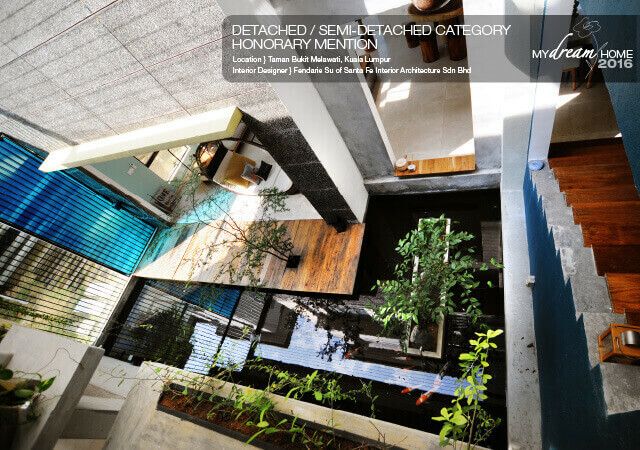 Nestled in the lush greenery of Bukit Tabur deep in a small enclave in Melawati, Ampang, Santa Fe consists of two adjoining bungalows with a built-up space of about 15,000 sq ft, which have been transformed into an expansive office and home respectively with a coalescing outdoor space. The idea for this was sparked by the designer’s desire to get back to a more natural environment. “I was just thinking one day, ‘can I walk through the door to work in a setting that is not urban?’” says Su. After years of being in the city, she wanted to explore getting back to basics. An imposing cement wall with an imprint of Santa Fe in Mandarin greets visitors. From outside, both the three-storey houses look no different from their neighbours. 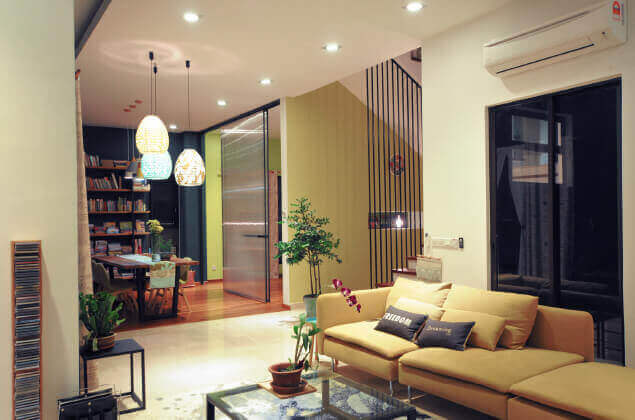 But inside, it is a world of difference with many of the rooms and walls knocked down in favour of an open layout, enhancing the interplay of design and space. One can be easily forgiven for mistaking the office foyer for a living room, where a large natural-wood table takes centre stage under a double-volume ceiling. Above it looms a tree branch artistically draped with black wire cords and light bulbs, a keepsake from a favourite tree. 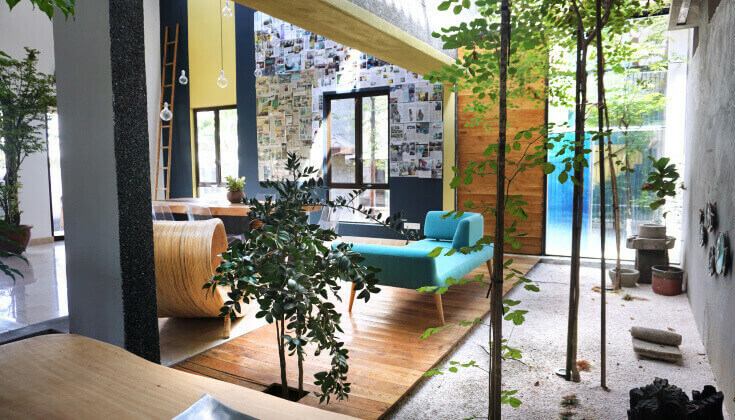 Further in, a turquoise chaise lounge sits in a connected courtyard flanked by two small trees. In a corner, partially shrouded by a leafy bush, are a small bench and a table. The only giveaway is the reception desk to the right of the foyer, which was originally the dining and kitchen area. 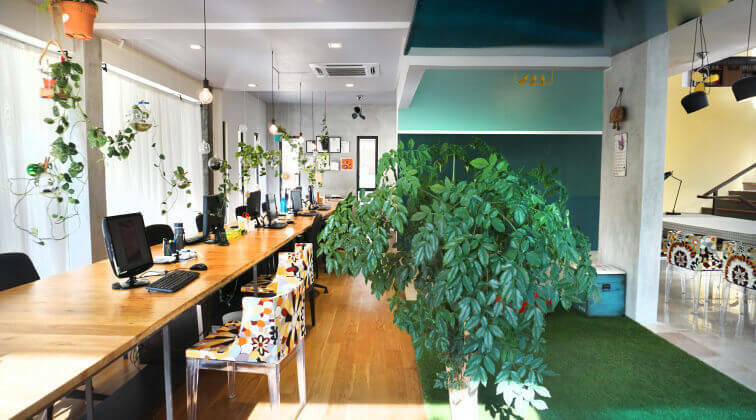 Su and her team have turned the office bungalow back to front in terms of the entrance, creating direct access from the guardhouse on the main road to the front gate. “We wanted our guests and customers to come in on a straight path. It’s easier. Also, the original entrance was on level two and we wanted it to be on the first level,” Su explains. The overall design follows concepts drawn from her study of Bagua qigong and Chinese philosophy. 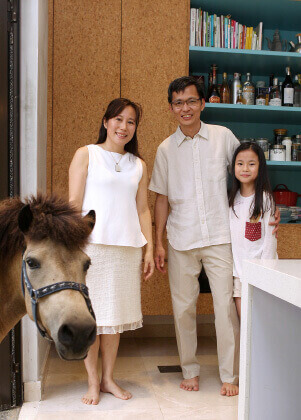 Starting with qi, Su focused on enhancing the natural energy around her office and home. All the main areas have an abundance of sunlight due to glass replacing the walls and the numerous windows in each room. The focal point of the home is the courtyard, which lets in fresh air and has hanging vines to shield it from the afternoon sun. “The courtyard has a deck and a fish pond. I meditate there, connecting with the sky and the water, with the fish swimming in the water. It is calming and creates an interaction with the outdoors,” says Su. 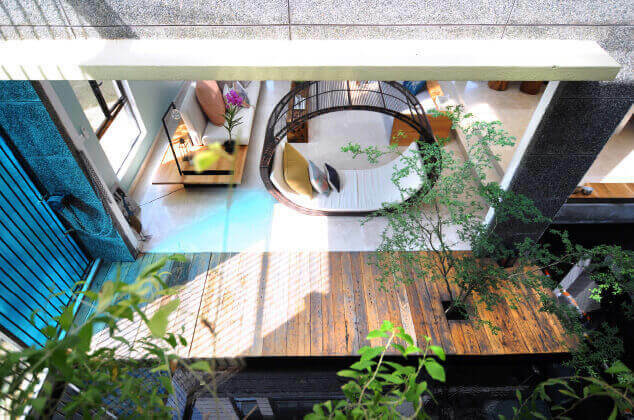 A floor above, a meditation corner greets guests as they enter the home. On the same floor is arguably the most indulgent part of the house — an open bedroom with a dipping pool, outdoor shower, rustic wooden bath tub and a spacious glass sauna. “When you go to hotels, rooms like these are always the most expensive. So I thought, ‘why not just do one here?’” laughs Su. Next, she worked on the idea of clarity or Jing as she calls it. Bringing in the sounds of nature, a rainwater harvesting system diverts water into a pool that sits underneath the main car porch, doubling as a cascading water feature that flows from the side when it rains. Typical of an interior designer, Su has furnished every space in the office and home in different styles. “The furniture always changes. A lot of them are our own designs. It’s like our practice ground,” Su points out. The dominant themes are wood, natural stone and recycled materials from their projects. A highlight is the office library inspired by the Japanese Zen style. “I also believe we need to ‘siu’ (cultivate) to constantly learn and work on ourselves,” says Su. When she does rest, it is in a suite shared with her husband Foo Wen Pok and daughter Fe Sa on the fifth floor. Here, a custom-made bed frame that fits a king-sized mattress and additional single bed dominate the bedroom with little other furniture. White curtains add a serene touch while the pyramid-shaped roof gives the room an airy feel.